Robin Youngs, Guy Kenyon,	The Journal of Laryngology & Otology, Volume 120 Issue 12, pp 991-992. A Manganaris, C Tsompanidou, T Manganaris,	The Journal of Laryngology & Otology, Volume 120 Issue 12, pp 1-4. J Bakshi, P K Parida,	The Journal of Laryngology & Otology, Volume 120 Issue 12, pp 1-3. J R Savage, G M Weiner,	The Journal of Laryngology & Otology, Volume 120 Issue 12, pp 1001-1004. R Mills, J Zhang,	The Journal of Laryngology & Otology, Volume 120 Issue 12, pp 1005-1007. F Taylor, C Hine,	The Journal of Laryngology & Otology, Volume 120 Issue 12, pp 1008-1013. M-I Kos, O Chavaillaz, J-P Guyot,	The Journal of Laryngology & Otology, Volume 120 Issue 12, pp 1014-1018. Magnetic resonance imaging scans for vestibulocochlear nerve tumours: what is actually found? E J Chisholm, L Savy, M Geyer, D Choa,	The Journal of Laryngology & Otology, Volume 120 Issue 12, pp 1019-1022. A Helbling, A Baumann, C Hänni, M Caversaccio,	The Journal of Laryngology & Otology, Volume 120 Issue 12, pp 1023-1025. K Stelter, M Andratschke, A Leunig, H Hagedorn,	The Journal of Laryngology & Otology, Volume 120 Issue 12, pp 1026-1032. Y Bajaj, B E J Hartley, M E Wyatt, D M Albert, C M Bailey,	The Journal of Laryngology & Otology, Volume 120 Issue 12, pp 1033-1037. A L Kadhim, P Sheahan, C Timon,	The Journal of Laryngology & Otology, Volume 120 Issue 12, pp 1038-1041. X Li, S Izumaru, K Sakamoto, Y Miyajima, T Nakashima,	The Journal of Laryngology & Otology, Volume 120 Issue 12, pp 1042-1048. P Martinez-Devesa, M L Barnes, C J Alcock, R S C Kerr, C A Milford,	The Journal of Laryngology & Otology, Volume 120 Issue 12, pp 1049-1054. Magnetic resonance imaging: is a single scan ever enough for the diagnosis of acoustic neuroma? M D Kernohan, K J Blackmore, I J M Johnson, I Zammit-Maempel,	The Journal of Laryngology & Otology, Volume 120 Issue 12, pp 1061-1063. I Street, P Jobanputra, D W Proops,	The Journal of Laryngology & Otology, Volume 120 Issue 12, pp 1064-1066. Rosen mobilization of the stapes: does it have a place in modern otology? G Thiel, R Mills,	The Journal of Laryngology & Otology, Volume 120 Issue 12, pp 1067-1071. M Martinez Del Pero, R K Sharma, A Raghavan, N Bateman,	The Journal of Laryngology & Otology, Volume 120 Issue 12, pp 1072-1074. N Agrawal, G A Morrison,	The Journal of Laryngology & Otology, Volume 120 Issue 12, pp 1075-1076. A Harimaya, Y Somekawa, M Sasaki, T Ohuchi,	The Journal of Laryngology & Otology, Volume 120 Issue 12, pp 1077-1080. G Kulamarva, J R Buckland, S Sapare, M B Pringle,	The Journal of Laryngology & Otology, Volume 120 Issue 12, pp 1081-1083. M Sugiura, S Naganawa, E Sato, T Nakashima,	The Journal of Laryngology & Otology, Volume 120 Issue 12, pp 1084-1086. J A Koempel, C A Solares, P J Koltai,	The Journal of Laryngology & Otology, Volume 120 Issue 12, pp 993-1000. M C Jäckel,	The Journal of Laryngology & Otology, Volume 120 Issue 12, pp 1055-1058. 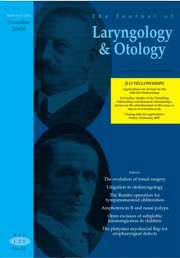 G Soo, M C F Tong,	The Journal of Laryngology & Otology, Volume 120 Issue 12, pp 1059-1060. The Journal of Laryngology & Otology, Volume 120 Issue 12, p 1087. The Journal of Laryngology & Otology, Volume 120 Issue 12, pp 1089-1091.